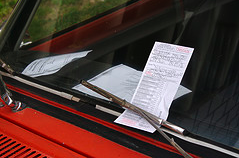 If there’s a car in your name racking up parking tickets but you haven’t been driving it or parking it, should you have to pay? A Chicago woman who claims her ex-boyfriend registered a $600 clunker in her name insists she shouldn’t be on the hook for the whopping $105,761.80 the city says she owes for the car, which sat in an O’Hare Airport parking lot for three years. It’s a particularly snarly case, reports TheNewspaper.com, as the car was parked for longer than it should’ve been to collect 678 tickets. The city requires any vehicle sitting for longer than 30 days to be towed but the vehicle in question was not, and instead sat for three years getting papered for a record amount of tickets in Chicago. The woman claims in a lawsuit against her ex, the city and United Airlinesthat her ex-boyfriend bought the 1999 Chevy Monte Carlo registered in her name after paying all the other fees associated with owning a car. She says she had no idea the vehicle was under her name. She says her ex drove the car to his job at O’Hare with United Airlines, and then left it in a parking lot. It’s a lot often used by United Airlines employees but is owned by the city of Chicago. According to the complaint, the man just never drove the car out after parking it on November 17, 2009. Normally after 30 days, the car would’ve been towed and the lot operators would’ve tried to contact the owner. The woman’s lawsuit says that never happened, and instead cops ticketed the car over and over. She claims if the city had done what it was supposed to and towed it, she wouldn’t be on the hook for so much money. She finally found out about the issue in December 2009 after receiving the first batch of a total of 391 notices from the Department of Revenue. In her complaint she says she tried to fix things by having her ex move the car, and even tried to move it herself but she didn’t have keys to the car or access to the secure lot. As things stand now, the car was finally moved to the pound lot at the airport, and she’s retained pro bono legal counsel to take on her case against her ticketing foes. *Thanks for the tip, J.W.! Next Do Different Walmarts Charge The Same Price For The Same Item? Next Up: Do Different Walmarts Charge The Same Price For The Same Item?